I have been collecting Kaffe Fassett fabrics for a few years. I have one quilt done and one quilt top done. But I still have lots of fabric to do more and I keep buying more. I wanted to do something new with hand stitching, so Hexagons it is. These Hexagons are 1" in size, a little bigger than I have done in the past (3/4" before). I have been fussy cutting some of the fabrics. This fabric had these crazy vases on them but when I cut six of them, it worked so well. I just love this flower. I have added the post to Slow Sundays, you can see what other hand stitching is going on. I have added this post to Sew Darn Crafty. Gives a whole new dimension to Grandmother's Flower Garden! They are gorgeous. These fussy cut hexies are so cute! Love your hexies. I getting more and more interested in this old quilt block in its new updated style. Thanks for sharing. 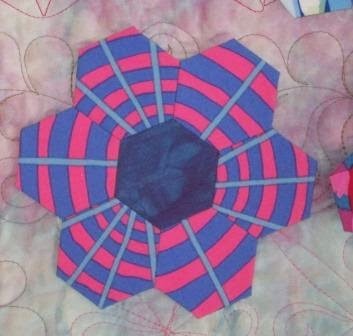 Perfect fabrics to make some hexagons with such wonderful movement! These are fantastic! Oh how yummy! I love the fabrics you are using. I love the movement that is created when using the patterned fabric! These are really awesome! 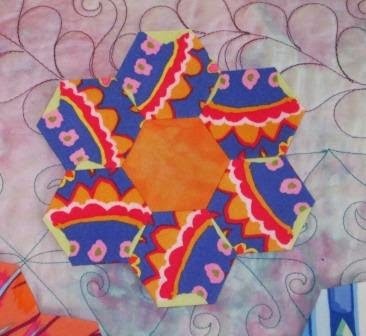 Kaffe fabrics + hexies = FUN! Your hexies are beautiful. And the colors! Just what we need to see at the beginning of Spring... that still looks like winter. 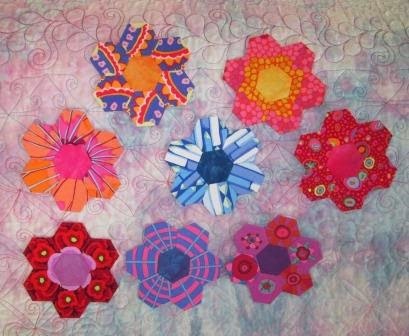 The way you cut the fabric gives an other dimension to the usual hexie flowers. Beautiful!